When working with chemicals, it's often important to know just how much of a specific chemical you're dealing with. There are a number of methods you can use to get this information depending on the specific substances you're working with, and the equipment you have available. In many cases, it's useful to graph the data as well, so you aren't just dealing with raw numbers. The graph gives you perspective and often makes multiple data points accessible with a single glance. The graphs most commonly used for this are titration curves. A titration curve is a graph that shows both the volume of a chemical and the pH of the solution containing that chemical on a two-dimensional axis. The volume is represented as an independent variable, while the pH is a dependent variable. Titrations are a form of chemical analysis, useful in determining the concentration of a specific chemical component within a solution. A titration is used when the chemical being measured is known, but its volume within the solution is not known. In a titration, a measured amount of a solution with a known concentration (known as the titrant) is added to the solution with an unknown concentration (known as the analyte). After any chemical reaction between the two solutions is complete, measurements are taken to determine the volume of the chemical being measured that's present in the final solution. Because the makeup of the titrant is known, and all chemicals in the solutions have been identified, this information is used to determine how much of the chemical is in the analyte. Titration curves are graphs that display the information gathered by a titration. The information is displayed on a two-dimensional axis, typically with chemical volume on the horizontal axis and solution pH on the vertical axis. The curve of the graph shows the change in solution pH as the volume of the chemical changes due to the addition of the titrant. Chemical volume is an independent variable on the graph, while pH (which changes as the volume of the measured chemical increases) is a dependent variable. Titration curves show how the pH of the solution changes as a known chemical is added to the solution, so any point along the curve gives you information on solution pH as the volume of the known chemical increases. The graph typically shows a gradual increase of pH until nearly all of the hydrogen ions in the solution are neutralized; at this point, the graph increases sharply. This almost vertical movement continues until the solution begins turning basic, at which point the graph levels out again. Almost all titration curves of acids or bases follow this same shape. Using the graph, the point at which neutralization occurs (indicated by the steep shift of the curve) can be found, as can the equivalence point where the solution reaches an equilibrium (which is halfway up the steep slope). The point at which the pH levels off again is also clearly visible. Using these points (and occasionally other select points along the line) and other data about the chemicals involved, it's possible to calculate the concentration of the known chemical within the analyte. 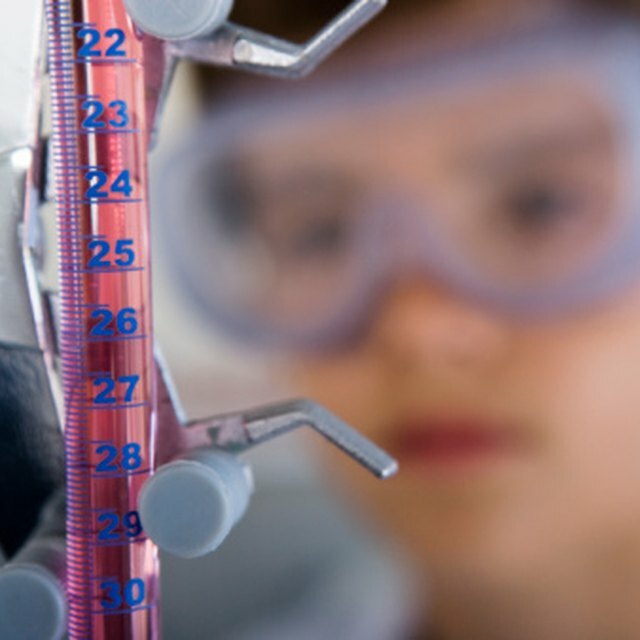 Purdue Division of Chemical Education: What Is a Titration? Gerard, Jack. "What is the Titration Curve?" Sciencing, https://sciencing.com/what-is-the-titration-curve-13712142.html. 18 May 2018.